This is the ideal outdoor vacation for the whole family. Unplug, relax and let the ranch welcome you home. Ride out on the range till your heart is content. Soak up the sun while you finish off a good book. Hike through rugged grasslands and ponder views of vast countryside. Take a canoe for a paddle on the lake. Whatever your idea of outdoor fun, there is something for each member of the family. We welcome visitors in tents and camper homes. Please ask for a quote on your specific needs. A full service wash house, with hot water, is available to our guests. At Big Bar Ranch there is something for everyone, from trusted steeds to fat trout, from advanced hiking trails to naps in the hammock, you will even find murder mysteries in the library. Unplug and settle in, there really is nothing like this home on the range. Experience the country side from the back of your horse. Each horse is matched to rider based on experience and size. Trail rides are kept small and guided by one of our knowledgeable wranglers. From beginners to advanced riders we have horses and trails to meet your desires and expectations. All riders must wear cowboy boots while on horseback, rentals are available for ranch guests at a nominal fee. Size limitations are in place for riding. Helmets are required of all those under 19 years of age. A signed waiver of liability is required before leaving the barn. Includes a packed lunch for the trip. Archery lessons coming soon in partnership with Red Feather Archery! Use of our private lake and canoes are included in your accommodate rates. Access to our hiking trails is also available to all our ranch guests. Please ask at the front office to receive your map of designated trails. There is no doubt about it, most people come for the country and the horses but there is a little known secret... we also know our way around a kitchen. Do a little or do a lot, that's the name of the game. Build a package that works for you but if you do anything at all... treat mom to the cookies. Meals at the Big Bar Ranch are served in our communal dining hall. Each meal is served on the buffet offering guests a selection of hearty home-style choices. Please let us know of any dietary requirements upon booking. MEALS MUST BE ARRANGED UPON BOOKING, THANK YOU! Our kitchen is open May through October only. Sorry for any inconvenience. The winter season at Big Bar Ranch offers an enchanting holiday experience. Escape the rush of the city and settle into the soothing quiet of snowy pastures and big blue skies. Spend your afternoons exploring the blanketed landscape or snuggle close to the fire with a good book and a cup of cocoa. Whither you are looking to unwind and relax or rekindle your enthusiasm to get out there, Big Bar will offer you the space to feed your soul in just the right way. Stay in tune for this winter’s new upcoming events! Cross country skiing , sleighs and Ice fishing will me made available for booking shortly! 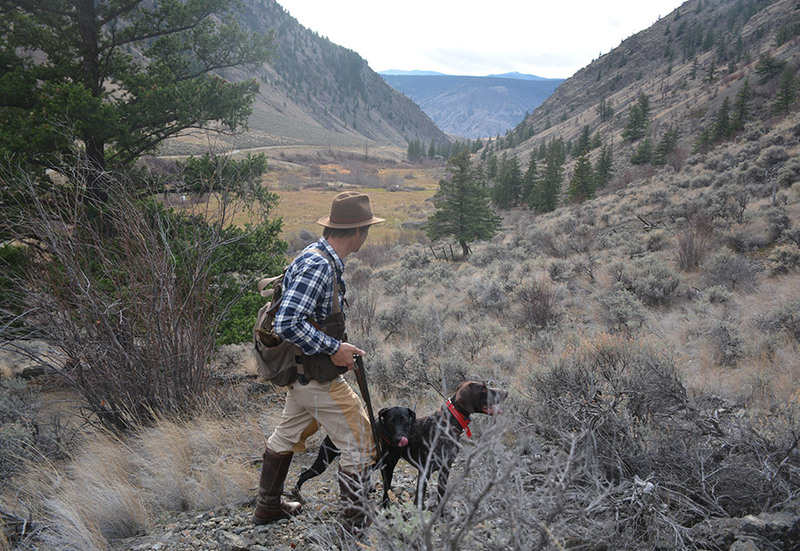 Among the rolling grasslands of BC’s Cariboo Region, an hour away from the town of Clinton and 5 hours outside of Vancouver, are the 14,000 acres of stunning landscape that comprise the OK Ranch and High Country Sporting Birds’ shooting terrain. High Country Sporting Birds is owned and operated by Charlie Squarey, the man who will help you plan the perfect shooting trip. Charlie grew up shooting and riding in this area and knows the landscape well in every season. He is also passionate about raising and training German short-haired pointers for hunting and shooting.